It wouldn’t be Halloween 2017 without some Halloween candy! Candies aren’t just for the kiddies, either. Many adults enjoy the bite-sized treats their kids bring home after doing all the work for them. Same classic favs include candy corn and peanut butter cups, but when it comes to Halloween Candy, the list is endless for delicious treats. Some of us prefer chocolaty treats, whereas others prefer a hard candy like. Whatever you fancy this time of year, there’s no arguing that this is the time when we all indulge a bit more—and break our diets—in order to get our hands on some Halloween candy. Below you will find some Halloween treats that are most popular nationwide. Will you be handing any of these favorites out to the children who come knocking this year? Candystore.com recently collected and analyzed data based on candy sales in order to provide us with the most popular Halloween candies by state. 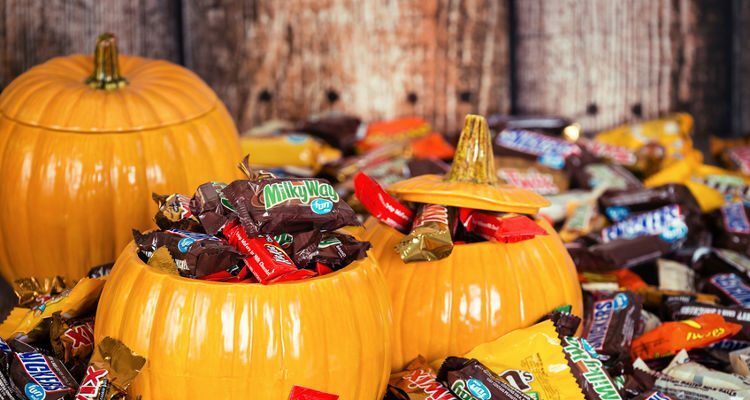 Sales were collected from 2007 to 2015 from the three months leading up to the candy-giving season—Halloween, of course. Here is the full list of most popular Halloween candies based on each state, as provided by their analysis. Twix bar: Alaska and Colorado. Hershey’s mini chocolate bars: Alabama. Jolly Ranchers: Arkansas and Utah. Salt water taffy: California and Washington. M&Ms: Washington, D.C.; Kansas; and Ohio. Skittles: Florida, Minnesota, and Pennsylvania. Hershey Kisses: Hawaii and Nevada. Reese’s Peanut Butter Cups: Iowa, North Carolina, Oregon, Texas, and Wyoming. Candy Corn: Idaho, Michigan, New Mexico, Rhode Island, and South Carolina. Hot Tamales: Indiana, North Dakota, and Virginia. Tootsie pops: Kentucky, New Jersey, and Tennessee. Milky Way: Maryland, Missouri, and Vermont. Sour Patch Kids: Maine, Nebraska, and New York. Starburst: New Hampshire and South Dakota. If you were keeping count, it seems that there is a tie between candy corn and peanut butter cups for being the most popular Halloween candy across the U.S.
How did you stack up? Is your favorite candy reflected by the state you live in? Will you be handing out your state’s favorite candy? When it comes to candy, personal preference is key; and so, just because these were the most popular candies in each state, doesn’t mean that everyone has to love them. Furthermore, there are so many delicious candies that didn’t even make the list! C’mon, what about the beloved Mars bar (aka Snickers Almond) or even Oh Henry! It seems some classic candies were completely missed if you ask us. But hey, you can’t really argue with scientific analysis. Regardless, the key to a successful Halloween is getting as much candy as you can; but really, try to avoid eating it all at once—you’ll be left with an equally-as-scary stomach ache. Remember, these little treats are small, but they still pack plenty of sugar and unwanted calories. It’s OK to treat yourself every now and then, but avoid binge-eating your kids collection. Lastly, and probably most importantly, always remember to brush your teeth! These sugar traps can send you straight to the dentist chair if you’re not careful. Gilmore, S., “State-by-State Guide To the Nation’s Favorite Halloween Candy Using 8 Years of Data [interactive],” candystore.com; last accessed October 20, 2016.